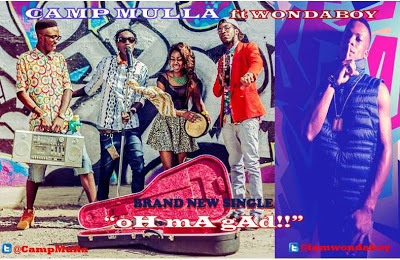 Kenya’s all-star hip-hop group and international BET Award nominees, Camp Mulla, recently collaborated with Nigeria’s newest sensation, Wondaboy, to record smash hit, “oH mA gAd! !” Rappers Kus Ma, Tripper & Shappaman combined with the very soulful sounds of Miss Karun and Wondaboy result in this catchy club hit that has already created waves in Kenya. Shot in Nairobi at Club Venom, this fun filled video captures the youthful hip sound and swag that Camp Mulla is notorious for in addition to Wondaboy’s creative and melodious hooks. While Kus Ma shines as producer on this track, Sub-Sahara Entertainment label mate, Kanja, makes a cameo appearance in the video which is directed by talented rapper, Kevin Bosco Jnr. With several other collaborative tracks and videos from Kenya in the works, Sub-Sahara, LNB Entertainment and Ear Candy Music have made Wondaboy one to definitely watch.